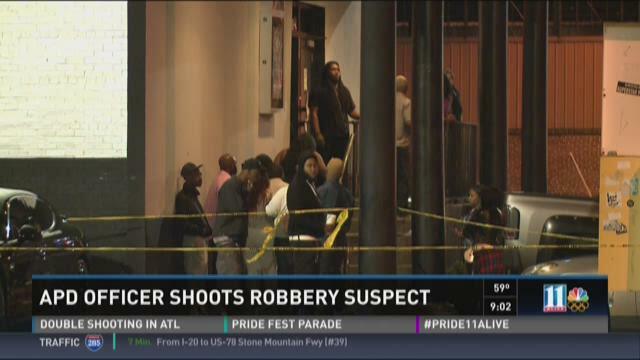 ATLANTA -- Two suspects are in custody after an officer-involved shooting outside a downtown Atlanta night club. The incident began around 9 p.m. inside the Magic City night club where a man was apparently robbed. Two suspects then ran out the door and after getting into a car encountered an Atlanta police officer. Authorities then said the officer opened fire at least five times hitting one of the suspects in the ankle. There were bullet casings in the parking lot of the club when news crews arrived. Not long after the first call, 11Alive crews learned of another scene at Ted Turner Drive and Mitchell Street where the suspects crashed into a silver car and fled a white SUV on foot. They were soon caught by police.